Welcome to the Biker Jewelry and Rock n Roll Jewelry Blog, the first blog of its kind. BikerJewelry.Info scours the globe for the hottest designers and artists for fine sterling silver jewelry - rock and roll jewelry - designer biker jewelry - skull rings - leather works - tattoos. 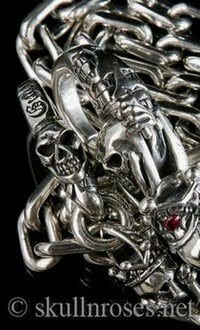 Real biker (rock n roll) jewelry is often highly intricate; custom; handcrafted; imaginative; and beautifully created pieces of wearable art made in sterling silver and other precious metals - SkullnRoses.net. Welcome to the Biker Jewelry and Rock'n'Roll Jewelry Blog, the first blog of its kind. We scour the globe for the hottest designers and artists for fine sterling silver jewelry : rock 'n' roll jewelry : designer biker jewelry : skull rings : leather works: Japanese silver jewelry design. The realist jewelry is often highly intricate: custom, handcrafted, imaginative - and beautifully created pieces of wearable art made in sterling silver and other precious metals. Biker Jewelry & Leather Blog est. in Los Angeles. 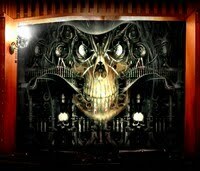 Skullnroses.net is an online luxury retailer of high quality, fine silver jewelry for bikers. We started this blog to help share, educate and inform fans and admirers of the various types of Biker Jewelry and Rock 'n' Roll inspired jewelry available in the world today - Sept 23, 2008. Define: Biker Jewelry (pronunciation: \'bi-ker 'ju-el-re\ noun) – biker jewelry, or rocker jewelry, is less conservative than various types of jewelry and carries more weight and substance. Biker jewelry is easily identifiable owing to its bold statement and trademark masculine look, often created using thick and heavy precious metals, especially sterling silver. It is not uncommon to find a one-pound sterling silver wallet chain made by a famous biker jewelry designer. The combination of leather (sometimes alligator or snake skins), silver and bold designs make up the essential elements of the born to be wild image. The good thing is you do not have to be a biker, or live the biker lifestyle, to wear and appreciate biker jewelry. The biker represents the ability to ride free, to flaunt your own style without boundaries and to live on your own time. Wearing biker jewelry is a statement of freedom and independence. The biker jewelry of today has evolved from the classic wallet chain and skull ring into highly intricate, custom, handcrafted, beautiful pieces of wearable art made in sterling silver and other precious metals. In the world of biker jewelry, boldness, designs and motifs matter. Commonly used motifs include dogs, eagles, skulls, daggers, roses, snakes, wings, stars, crosses, lion heads, dragons, and flames. Aficionados of biker jewelry treasure good silver designs just like tattoo lovers value great ink designs. Patina on silver provides beautiful black and silver contrasts like no other metals. It can bring out the depth and detail of intricate designs, a look that silver fans adore. Los Angeles and Tokyo are the biker jewelry capitals of the world. Biker jewelry lovers are known as "silver freaks" in Japan. The first Japanese to admire biker jewelry were young tourists visiting Los Angeles in the 1990's. ...read more at Biker Jewelry 101. Author: Mr Skull N Roses - "LIVE FREE OR DIE TRYING"
If you would like to contribute to our website: drop us a line at sales@skullnroses.net. Biker jewelry is all about freedom! Get your daily dose of real biker jewelry from our 925 arsenal of world class designers. Update: As of August 2009, www.BikerJewelry.Info is being followed in over 38 countries! 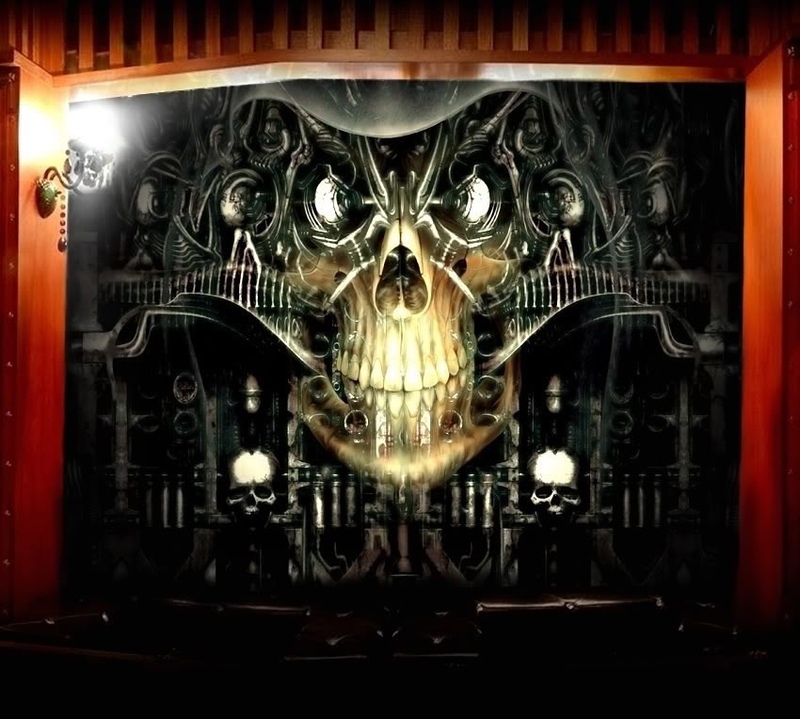 "And they bring Him unto the place Golgotha, which is, being interpreted, "The place of a skull." www.bikerjewelry.info (Proverbs 16:9). Powered by Blogger.